Every year the NBA Summer League brings together individuals from all over the world. We’ve been lucky to call these people our family. We are proud to recognize our alumni who have been able to go out and build their career in sports, and this week we would like to feature Summer League alum Morgann Mitchell. 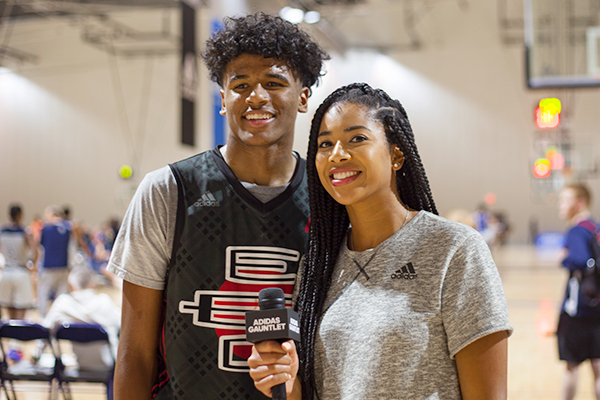 Along with working at Summer League, Morgann has helped us with other work, recently as our on-air talent during our livestream broadcast at the adidas Gauntlet Series in Atlanta. Now, Morgann has translated her experience into a career with Turner Sports! Q: Tell us about your experience interning for the NBA Summer League. What were your responsibilities? At VSL I was fortunate enough to be one of the social media interns that was assigned to work with the Turner Sports team, which Is how I got into my current position. We were covering games, collecting b-roll for packages, getting content from the pressers and telling the story of summer league on social media. Q: Were there any highlights? It’s going to sound corny but, honestly the people I met and am still cool with to this day made summer league amazing. It’s a weird summer camp type of bond we all have and I love seeing people grow and succeed. My favorite thing is running into VSL alums at NBA events and catching up. Q: Is there anything that you learned from Summer League that you apply to your current job? Making personal connections are so powerful and being able to market yourself well is something you have to be able to do well. Communication is key. Q: Can you tell us more about your job working with NBA TV? My job is to make sure we have the right content for tent pole events like Summer League, All Star, Draft, etc., and that on a daily basis we’re supporting the NBA TV network and also keeping up with relevant NBA storylines. I get to watch basketball for a living, I’m living the dream. Q: Was your end goal to work in sports? As a kid my favorite subject was PE, I was a multisport athlete, and my favorite activity was watching TV so I just had to figure out a career that combined those things. Q: Your job is something others dream of doing, what advice would you give to someone who are trying to find a career into the sports industry? Persistence is key and don’t be too proud to humble yourself to get a foot in the door. Give your work the respect and enthusiasm it deserves to set yourself apart. I love going to concerts and listening to live music. I admire a lot of people for various things but, my mom will always be my #1 and is my gold standard for the type of person I want to be. I am a karaoke master. I perform with the best of them while not being able to actually sing haha. Interesting place you’ve gotten to travel to for work? The 2017 NBA Finals. Being on the court as the confetti came down is one of those moments I’ll never forget. Most memorable or favorite sporting event you’ve been to, whether through work or for fun? I’m an alum of Clemson University and our football games are the best in the country, don’t @ me.